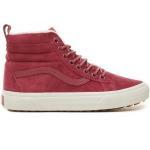 Womens Skate Branded Footwear: Trainers, Shoes, Sneakers. Many of the skate shoes in our men's section are unisex but if you're after a more feminine look then you're in the right place. All our ladies trainers come in sizes UK 4 up to UK 7. The Vans Authentic Shoe is a classic staple for any wardrobe and comes in a range of colours and we love the retro styling of the Classic Vans Sk8 Hi.